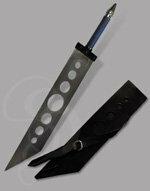 This is a limited edition Buster sword, made from the finest High Carbon steel. This is not a toy. It is for real, not sharpened, but otherwise a very real, very strong, very heavy, very nice. This is a magnificent piece of steel. Long and beautiful, with a 32 Inch blade and a massive 8 inch grip. Oh, and did we mention that it's under 3 pounds? At a towering 52 inches long, the Irish Two-hander can both intimidate and impress friends and enemies. 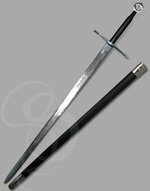 Its most notable feature (other than its size) is the polished-steel Celtic ring pommel at the base of the grip. At an impressive 58 inches, This claymore features a massive redwood twisted hilt that truly is beautiful to look at. The brass hardware of the pommel and cross sets off the redwood perfectly. The 42 inch carbon steel blade is polished to a mirror finish. 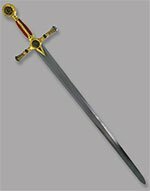 A red velvet grip with golden accent, a decorative guard and pommel with Masonic symbols plus an impressive 45 overall length with a 37 inch polished stainless steel blade make this a sword fit for royalty. 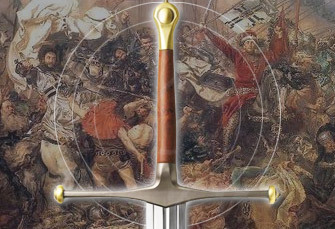 The Pendragon captures the power, nobility and mystery of legendary King Arthur and his mystical sword, Excalibur. 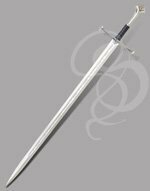 This version of Excalibur is long--nearly four foot in overall length, with a wide stainless steel blade that's absolutely perfect for engraving. This is a beautiful piece of historically based artwork. It bears a 32.5-inch stainless-steel blade that is smooth and perfect for engraving. The black leather scabbard bears ornately carved and gilded collar and tip. This is a licensed replica of ICE from the HBO series Game of Thrones. ICE is huge measuring almost 58 inches in length. This adult collectible is officially licensed and includes a display plaque and a certificate of authenticity. 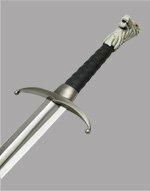 This is an officially licensed replica of Longclaw, from the HBO series Game of Thrones. It features a 35 inch polished stainless steel blade and a wolf head shaped pommel. It includes a wooden wall mount plaque with the oath of the night Watch silk screened on it. 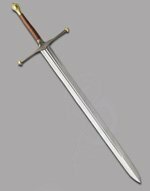 This is an accurate reproduction of the sword that Aragorn/Elessar carried in Peter Jackson's The Lord of the Rings: Return of the King. The 420 stainless steel blade is flawless. The runes etched onto the blade are done tastefully and as faithful to Tolkien's descriptions as possible. 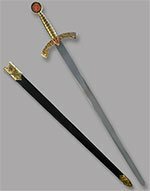 This is a reproduction of type of sword known as the Kilij, or Kilic (depending on your mood and ability to pronounce words ending in 'J'). The Kilij was a fearsome weapon in the Ottoman empire, when men in armless chairs conquered most of the areas of the Mediteranean east of Italy. Okay, so we're kidding about the chairs, but we're serious about the conquering stuff. The Ottoman empire was one of the longest running empires in history, spanning from the late 13th century to the early 20th century. These backswords were used in the later days of the empire and featured a fearsome flare towards the tip. This flare, known as a 'yelman' did indeed make men yell in fear. Aside from its holy-crap shock value, the yelman gave the sword a better heft towards the front and much more power when used to slash. If you were hit by one of these swords, you were probably going to lose a piece of you. Some Kilijeses (okay, I truly have no idea what the plural of Kilij is. Deal with it) had even larger flares at the tip, which made the slash even more devestating, but also made the weapon a little more cumbersome. You've seen Kilijesessesees before in movies like Indiana Jones: Raiders of the Last Ark, Aladin and Sinbad. 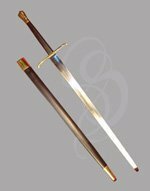 The weapon falls into the Western classification of Scimitar, in the same family as the Shamshir and the Tulwar. 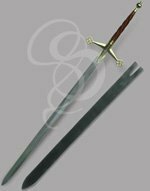 Curved Swords The exact origin of curved swords is something that has been debated for years. It is generally accepted that the majority of curved swords came from the East. Curved swords most likely manifested somewhere around Egypt, with the appearance of the khopesh (a weapon somewhere between sickle and sword). Since then, a number of curved swords began appearing in the East and westerners took to calling such curved swords "Scimitars." Technically, there isn't one sword that is called a scimitar; the term refers to the entire group of curved swords that came from East (excluding the Japanese curved swords). 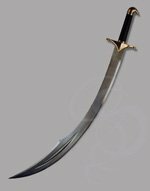 The term may be a derivative of "Shamshir," which was a thin curved sword from Persia, although the shamshir wasn't really popularized until the 1500s. 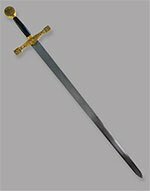 Other scimitars include the Turkish kilij (think of the massive cleaver swords from Aladin and you have a fairly accurate picture), and the Indian Tulwar (somewhere between a shamshir and a kilij). Some smaller curved weapons from the east include the Kopis (a knifelike curved blade that probably was the predecessor of the Khopesh), the Nepalese kukri and the hook-handled falcata of ancient Spain. Curved swords weren't confined to the east, of course. As the scimitars developed in the east, the west was catching on to the trend. Sabers and cutlasses were slowly conceptualized and developed in Europe. The curved blades were ideal for charging horsemen who tended to lose their straight blades in the bodies of their haplessly impaled foes. The curved sabers could slash opponents and slide off as the horsemen rode by. Another advantage was that curved blades were more compact than straight ones, so horsemen were also able to slash from side to side without worrying about trimming the ears off their horses. Sailors also liked this compact size, since ship-board combat was often in very close quarters, with a vexing amount of wooden obstacles for swords to get embedded in. This explains the stereotypical image of the pirate holding a cutlass, reinforced recently by Johnny Depp, Orlando Bloom and Kierra Knightley in the Pirates of the Caribbean movies. A back sword is a sword that has only one edge. The non-sharp edge of the sword is known as the "back" of the blade. These swords often are curved. Examples of back-swords include most cutlasses, sabers and what westerners refer to as "Scimitars."